Any logo, any text, unlimited colors. Ready for a price quote? Enter your details and we'll email you an instant price quote. Your price quote will now appear. To order, simply select your options and click "Add to Cart". People carry Wallet Ninja and use it regularly. They'll see your marketing message each time they reach for their Wallet Ninja. What other giveaway item can say that? Wallet Ninja is made of 4x Heat-Treated Stainless Steel. It’s virtually indestructible. People don't throw it out. If they can't use it, they re-gift it to someone who can. What trade show handout at this price point can say that? Wallet Ninja has two sides with plenty of space for your logo, graphics, and text. 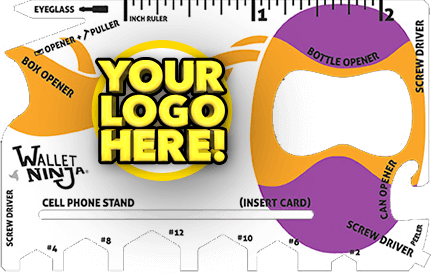 What logo item has more space for your logo, contact information, and marketing message? Wallet Ninja never runs out of batteries. It never breaks. It never runs out of ink. It never gets old or goes out of style because it's actually super useful. What other giveaway item can say that? Wallet Ninja is the simply the best all-around "logo gift" ever invented. Your investment in custom Wallet Ninjas will pay dividends for many years to come. 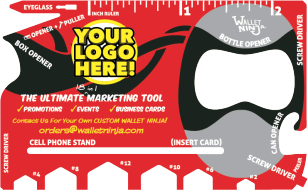 Trade Show Giveaways - Wallet Ninja has been called “the best trade show handout ever”. This is a trade show gift that drives business long after the show. Promotional Gifts - Custom Wallet Ninjas are a guerilla marketer’s best friend. Give customers a Wallet Ninja as a thank you when they buy from your store. Give clients a Wallet Ninja to help get that extra star in online reviews. Goodie Bag Items - A customized Wallet Ninja is the perfect gift for conference attendees. Our low order minimum (just 100 units) makes Wallet Ninja the perfect goodie bag item. Holiday Cards w/Gift - Because they're flat, custom Wallet Ninjas can be shipped using USPS First Class Mail as "envelopes" or "flats". The wallet ninja weighs only 1 oz. Typically, including a wallet Ninja in a holiday card or direct mail piece only increases the postage cost by pennies. Each time your client reaches for the Wallet Ninja to open a bottle, tighten a screw on his/her glasses, make a measurement, open a shipment from Amazon, peel an orange, or use any of the 18 tools, your brand is in their hands! To place your order, click the "Order Now" button below. Production time is approximately 10 business days. Want instant answers? Check out our F.A.Q.'s! Guaranteed to never rust, bend or dull. Unique and reconizable Patent # D751,877S. Low quantity starting point for any budget. Hear back from us quickly within business hours.